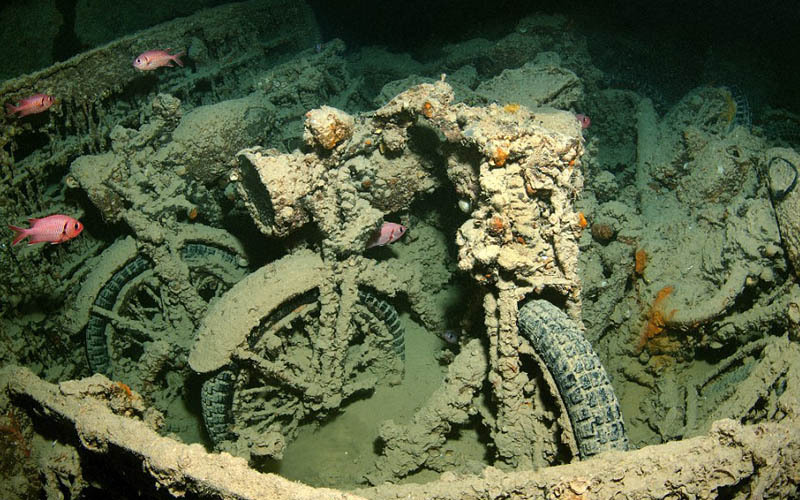 Probably the best wreck dive in the world. 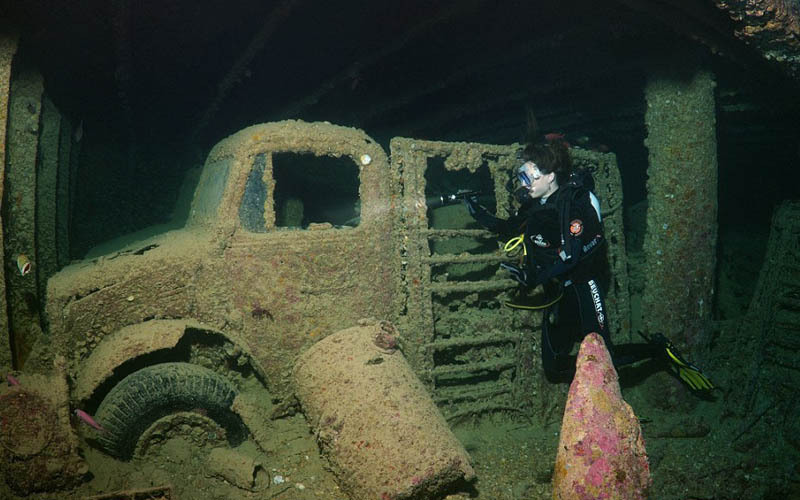 The SS Thistlegorm was built by Joseph Thompson & Sons shipyard in Sunderland for the Albyn Line and launched in April 1940. She was powered by a triple-expansion steam engine rated to 1,850 hp (1,380 kW). The vessel was privately owned but had been partly financed by the British government and was classified as an armed freighter. She was armed with a 4.7-inch (120 mm) anti-aircraft gun and a heavy-calibre machine gun attached after construction to the stern of the ship. In May 1941, the SS Thistlegorm was in her home port of Glasgow loading supplies essential for the 8th Army and the relief of Tobruk. Though described on the manifest as "MT" (Motor Transport), this - probably deliberate, non-description hid a wide array of Land Mines, Shells, Ammunition, Weapons, Bedford Trucks, Armoured Cars, Bren-Carriers, BSA Motorcycles, Trailers, Vehicle spares, Aircraft and Aircraft parts, Radios, Rubber thigh-boots - and a great deal more besides. To save cargo space, the Motorcycles were placed onto the back of the Bedford trucks - three at a time before loading. 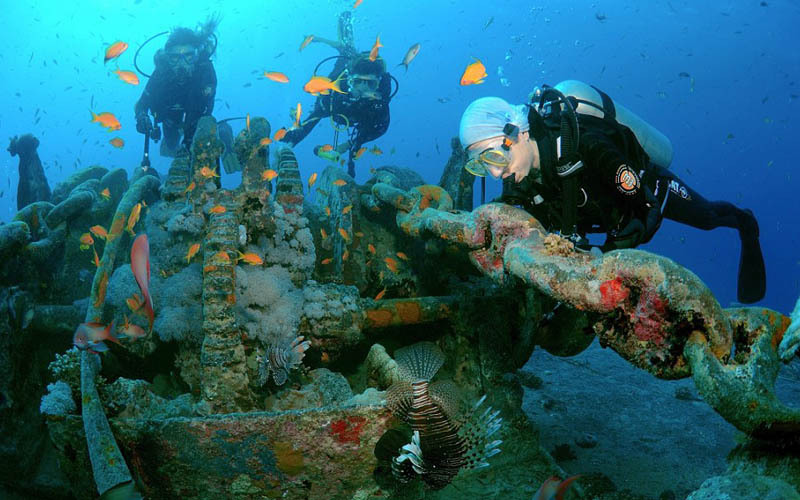 Due to German and Italian naval and air force activity in the Mediterranean, the Thistlegorm sailed as part of a convoy via Cape Town, South Africa, where she refuelled, before heading north up the East coast of Africa and into the Red Sea. On leaving Cape Town, the light cruiser HMS Carlisle joined the convoy. Due to a collision in the Suez Canal, the convoy could not transit through the canal to reach the port of Alexandria and instead moored at what was deemed to be Safe Anchorage (F) off the South Sinai Coast known as Gubal Strait. It’s said that the Allied forces were amassing troops in the area and German intelligence were looking out for the Queen Mary which was thought to be carrying troops. Two Heinkel He-111 aircraft were dispatched from Crete to destroy the Queen Mary. This search failed but one of the bombers piloted by Ltn. 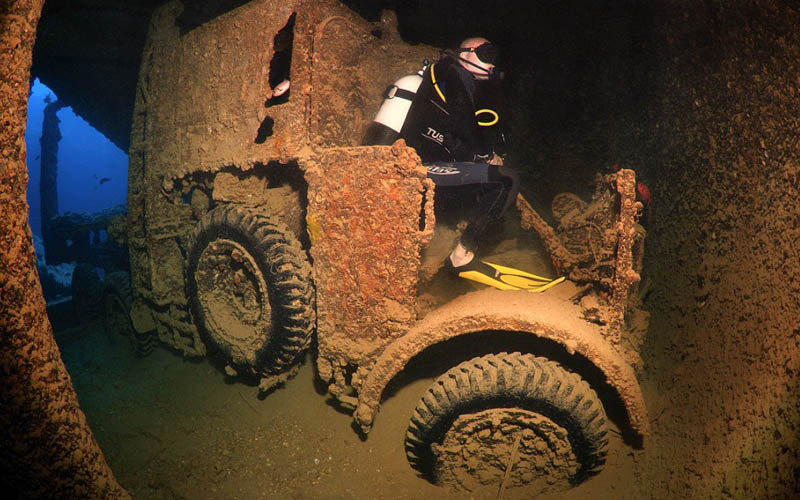 Heinrich Menge from the 26th Kamp Geswader, second Squadron discovered the vessels moored in Safe Anchorage F. Menge went for the largest ship and released his bombs which hit near hold four of what turned out to be the SS Thistlegorm. 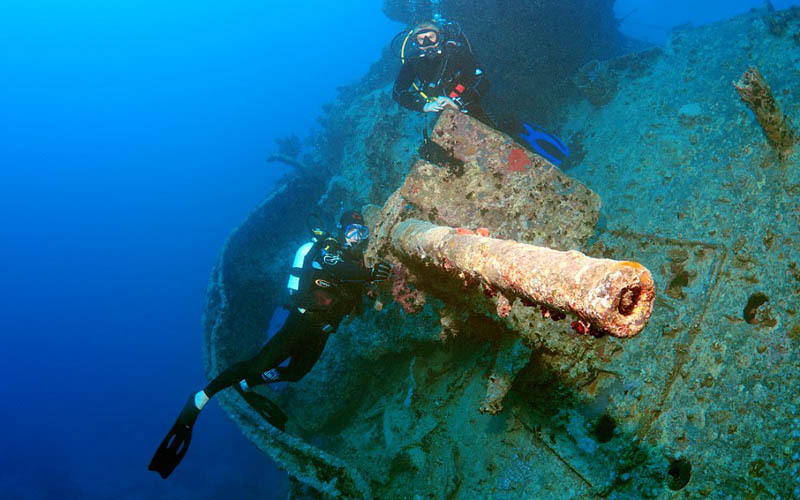 Hold 4 had ammunition and the blast from the bombs and the explosion led to the loss of the Thistlegorm, four of the crew and five of the Navy Gunners. The survivors were picked up by HMS Carlisle. Captain Ellis was awarded the OBE for his actions following the explosion and a crewman, Angus McLeay, was awarded the George Medal and the Lloyd’s War Medal for Bravery at Sea for saving another crew member. Most of the cargo remained within the ship, the major exception being the steam locomotives from the deck cargo which were blown off to either side of the wreck. 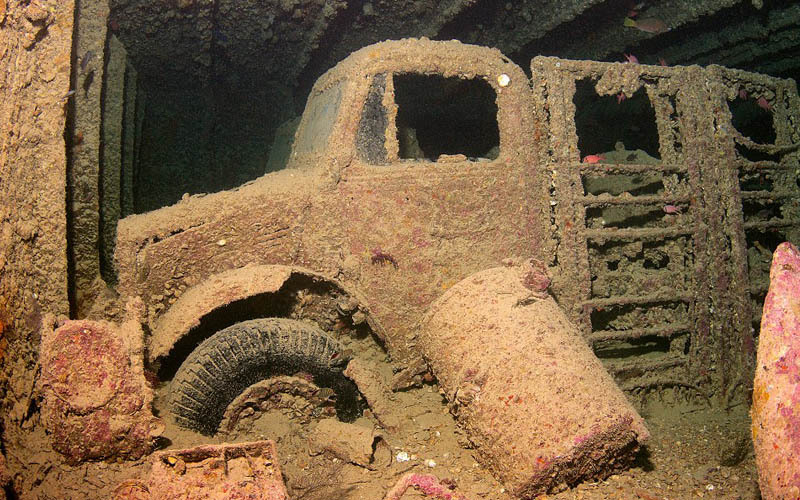 In the early ninteen fifties, Jacques Cousteau discovered SS Thistlegorm by using information from local fishermen. The wreck was also marked on a 1948 update to an Admiralty chart – something this project has uncovered. 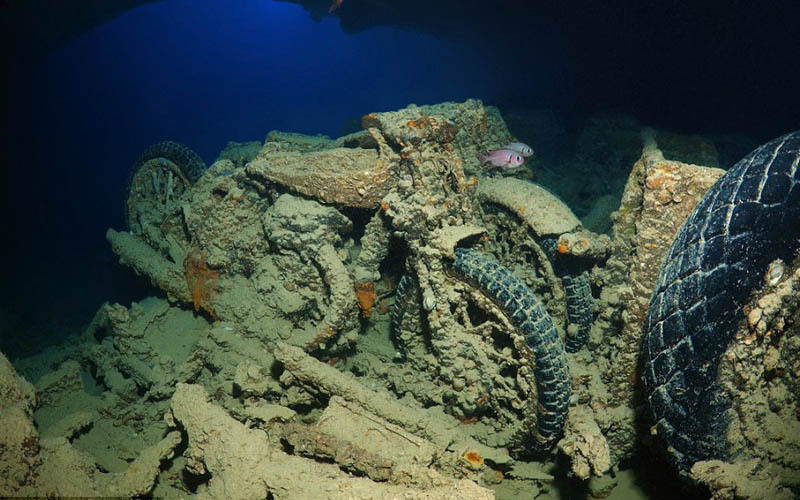 He raised several items from the wreck, including a motorcycle, the captain’s safe, and the ship’s bell. The February 1956 edition of National Geographic clearly shows the ship’s bell in place and Cousteau’s divers in the ship’s lantern room. 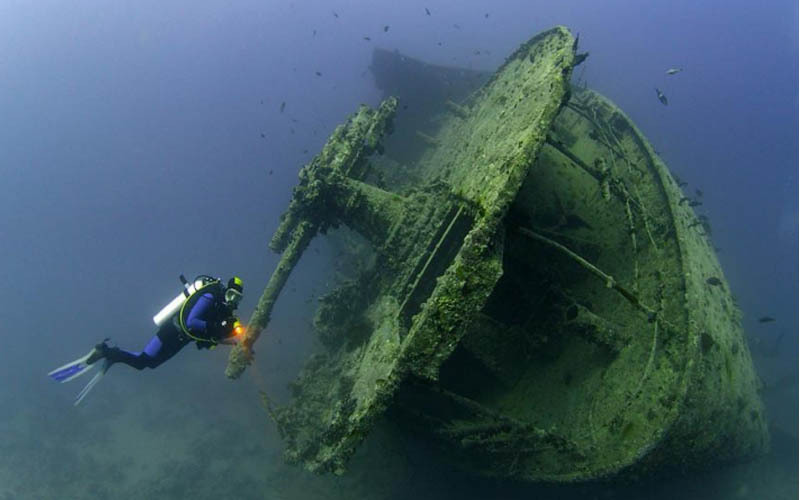 Cousteau documented diving on the wreck in part of his book The Living Sea. 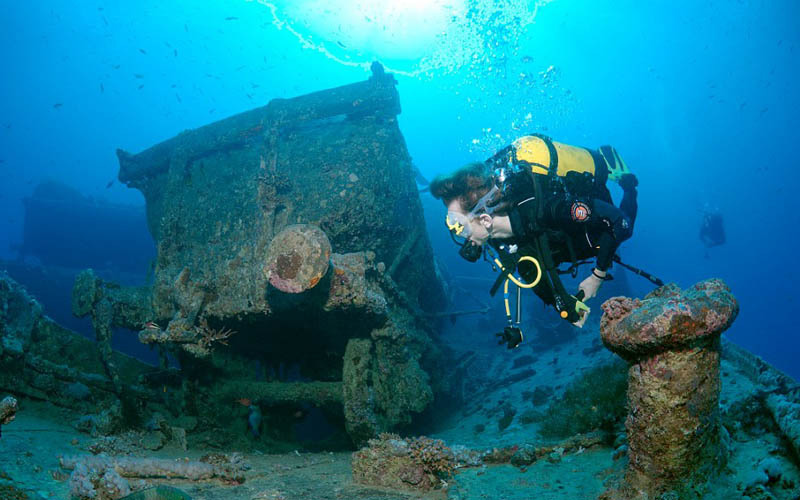 The wreck is in a remote location, the dives are deep, bottom times are long, and the bulk of the dive time is spent exploring the dark, cramped interior of the ship. An advanced certification and experience with all the above are a must. 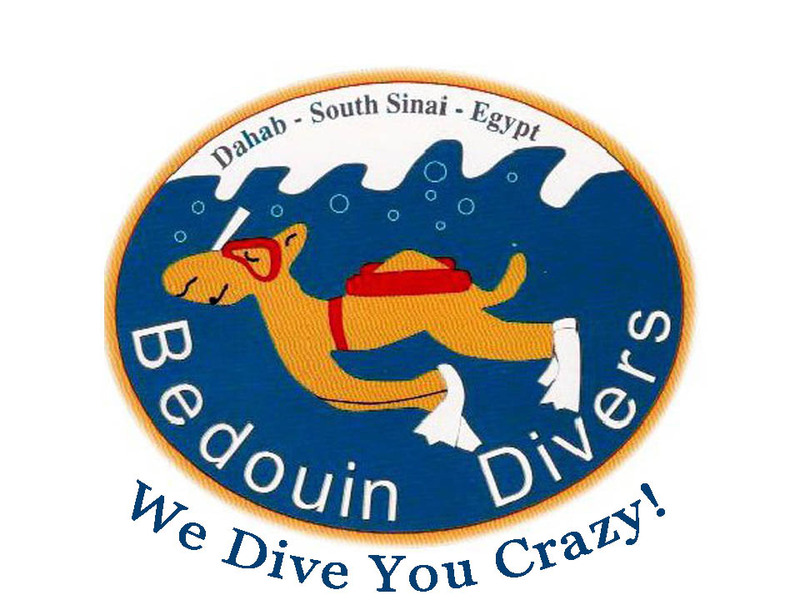 The following specialty courses are recommended: Wreck, Deep, Peak Performance Buoyancy. 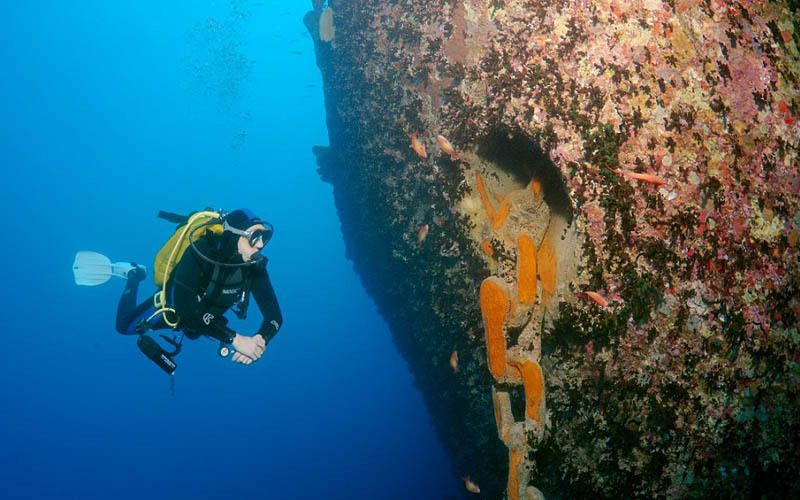 All areas of the ship are accessible to recreational divers, though technical training, such as advanced nitrox, decompression diving and a dual-tank setup will allow great depth of exploration on each dive. 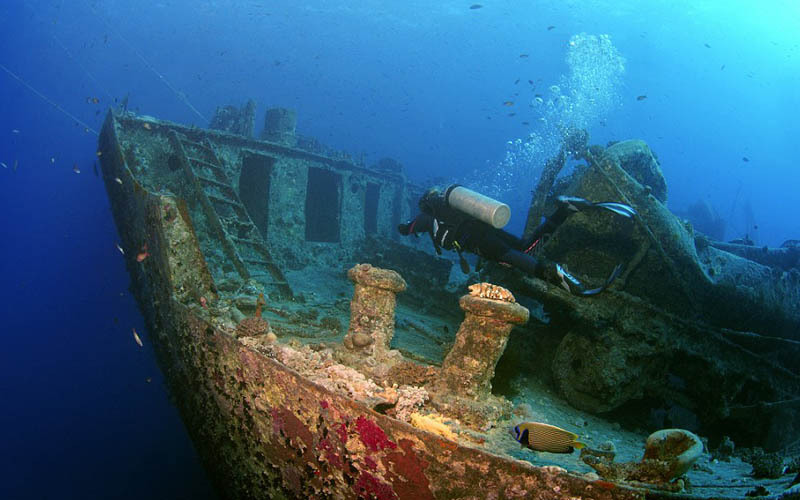 Start with a deep dive around the stern and then explore the exterior of the wreck. 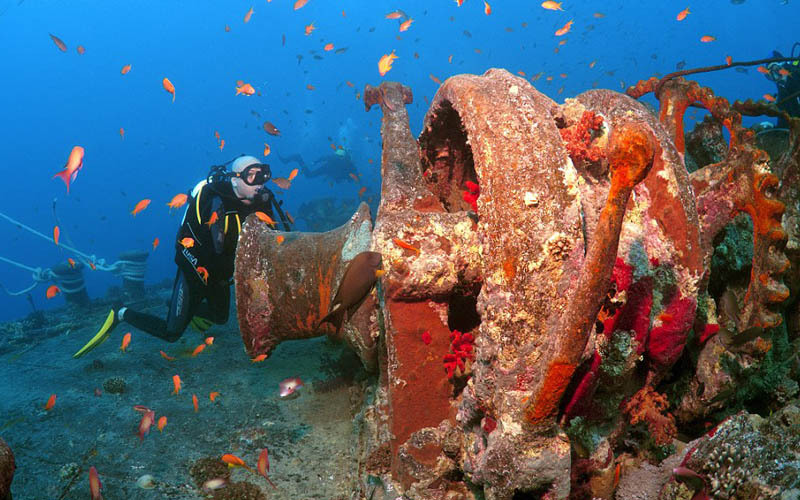 The stern section rests on its port side, which makes the huge propeller and rudder near the seafloor must-see features. Along your way around the back end, you’ll pass anti-aircraft guns before reaching the bombed out area. 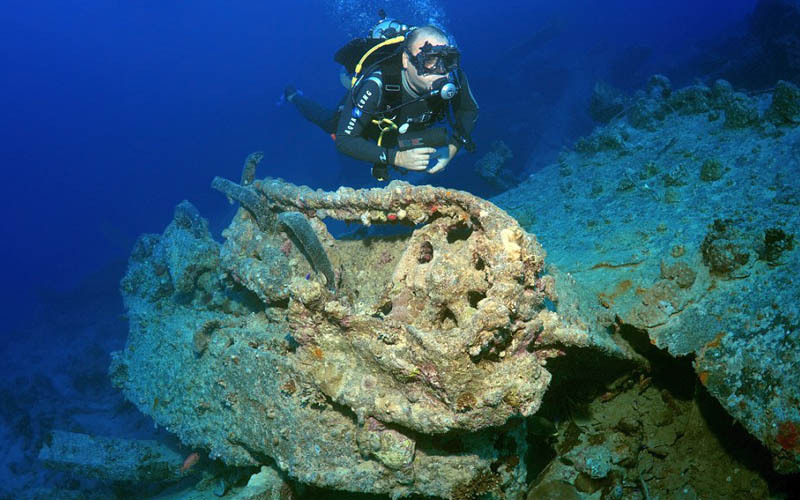 Spend a few minutes here exploring the debris field — a keen eye can spot a wide variety of loose artifacts. From here ascend to the shallower depths at the top of the superstructure. Make light penetrations into the captain’s cabin and bridge before swimming along the top deck, which still sports railcars, a torpedo, davits, masts and winches. The second dive is all about the interior. The best access point is Hold 3, just forward of the bomb damage — this lets you start at depth and work your way shallower as you move toward the bow. Holds 1 and 2 house Morris automobiles, BSA motorcycles, Bedford trucks, ammunition, Enfield rifles still loaded in their racks, as well as crates of medicine, tires and mounds of rubber “Wellington” boots. 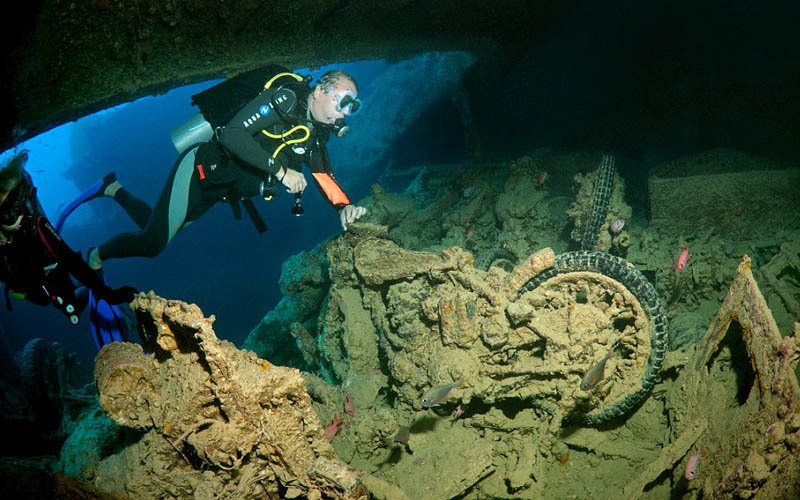 And be aware, the Thistlegorm is an extremely popular dive, and it’s common for two or three groups to be inside the wreck at any given time. So, bring a light and stay close to your guide when inside the wreck. Enfield rifles still loaded in their racks, as well as crates of medicine, tires and mounds of rubber “Wellington” boots.